Virtual Ecotourism » Interactive. Educational. Immersive. 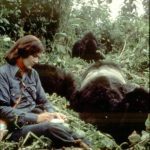 Ian Redmond reacts to the WWF Report on Sky NewsIntroducing vEco Labs!vEcotourism at UN CMS CoP12 in the PhilippinesHappy World Gorilla Day!vEco’s Ian Redmond receives RSPCA-Daily Mirror “Animal Hero” award! vEco’s own Ian Redmond, OBE, appeared on Sky News today to react to the WWF’s 2018 “Living Planet Report” wherein the venerable conservation organization estimates that the Earth has lost 60% of its vertebrate species abundance in only the last 40 years. Ian called for all people to start looking to species conservation as “enlightened self-interest” and encouraged governments to set up programs to divert significant resources towards preserving the biosphere. The full report is available from the WWF, here. Now that the vEco team has migrated our core technology over to the Unity development engine, we’re bringing all kinds of innovative 360 features into the fold, like true 3D menu scenes, spatial audio, and in-tour minigames! Because not all of these new features are available as part of a finished tour at this time, we’ve created the vEco Labs app as a way for our users and potential clients to check out what we’re working on. Download the iOS or Android mobile app for free, now! 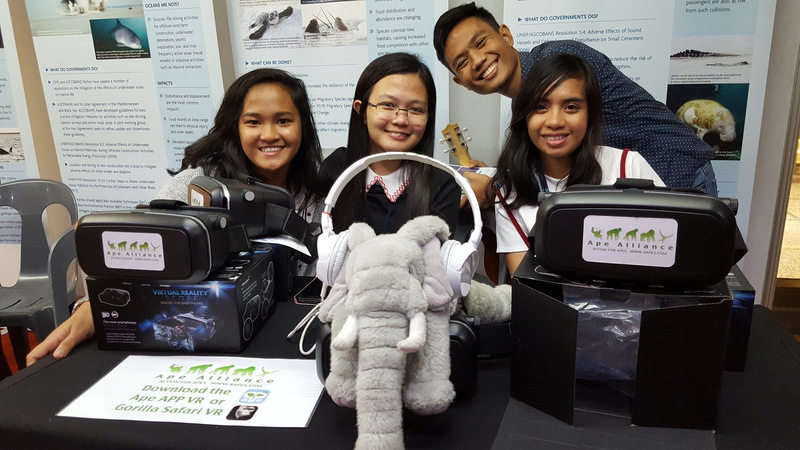 Virtual reality experiences of nature were a highlight for some delegates and volunteers at the United Nations Convention on the Conservation of Migratory Species meeting in Manila recently. The 12th Conference of the Parties to the CMS, hosted by the Government of the Philippines, brought together delegates and observers from the 124 signatory countries and observers from NGOs, IGOs and countries considering whether to sign. vEcotourism.org was there to demonstrate our two published apps and give previews of new ones to come. 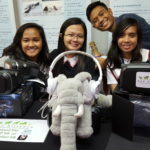 An enthusiastic team of volunteers brought the booth to life, downloading the apps onto their smartphones and using VR headsets kindly loaned by the Ape Alliance www.4apes.com to take interested delegates on a virtual safari to see the great apes, using ApeAppVR and Gorilla Safari VR. 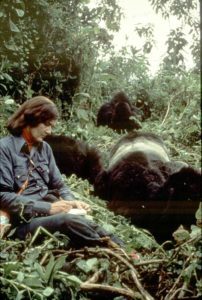 Gorillas are already listed on the CMS appendices and protected by the Gorilla Agreement, a legally binding treaty between the 10 African countries in which they live. At this meeting, chimpanzees were – after some heated debate – also listed, and will now benefit from better cross-border protection where their habitat straddles international borders! Team vEco would like to express gratitude to the CMS Secretariat, the Philippines International Conference Centre and all the volunteers, including: Ana Patricia Sison, Keith Deephy, Paula T. Apulinn, Jex O. Trinanes, Karyz Arboleda, Princess Lim, Frances Tenorio and Thomas Bell. The vEco team is both proud and delighted to congratulate our own Ian Redmond, OBE, on his recent Animal Hero award from the RSPCA & Daily Mirror. Ian was selected for the “Next Generation” award for his tireless efforts to inspire future generations to safeguard Earth’s natural wonders. Follow this link to read the full award text, and check out the video below to hear about Ian’s journey from research to animal advocacy as well as a personal congratulations from Sir David Attenborough. Here’s to many more years of engaging young people all around the world, especially using our very own cutting-edge virtual tour technology! London’s Great Gorilla Run 2017! 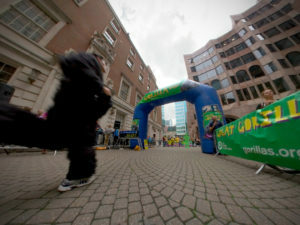 There are fun runs and then there is the GREAT GORILLA RUN — more fun for a good cause than any other event in conservation! At least that is what British comedian and TV naturalist Bill Oddie says. Tomorrow, Saturday 16th September, the 15th Great Gorilla Run will see hundreds of people dressed as gorillas, with fancy dress on top, run for 5 miles (8km) through the heart of London — past St Paul’s Cathedral, the Shard and over Tower Bridge — all to raise funds for the important work of the Gorilla Organization. Two members of Team vEco will be running — so if you can make it to London to cheer them on, come and join the party. If not, click HERE to travel back in time to 2014’s run, and when you’ve seen Bill Oddie and Uri Geller presenting medals and admired the inventiveness of the costumes, please visit the JustGiving pages of the Punk Gorillas or Ian Redmond and chip in a few £,$ or € for the real gorillas (who you can also visit virtually) and the communities living around their forest. Thank you very much. 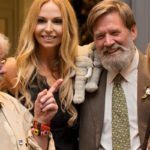 Come along with our vEco Ambassador, Ian Redmond, as he co-presents a petition to end the UK domestic ivory trade to 10 Downing Street. Recorded at the Global March for Elephants and Rhinos in London last year, this 360 video is especially relevant as the UK parliament just discussed this issue yesterday! 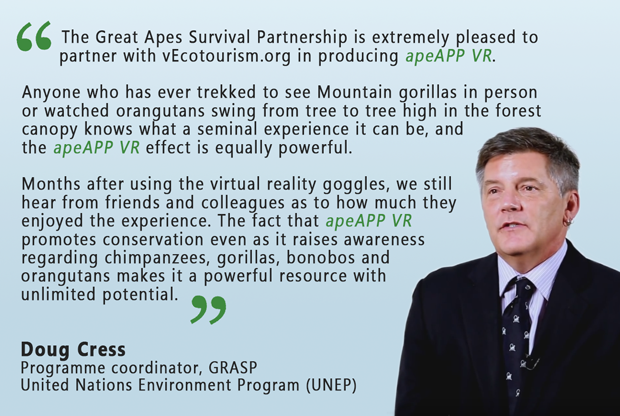 Working with the Born Free Foundation, and in honor of longtime friend and colleague John Kahekwa, we’re very pleased to announce the release of Gorilla Safari VR, our latest vEcotour mobile app for Android and iOS. 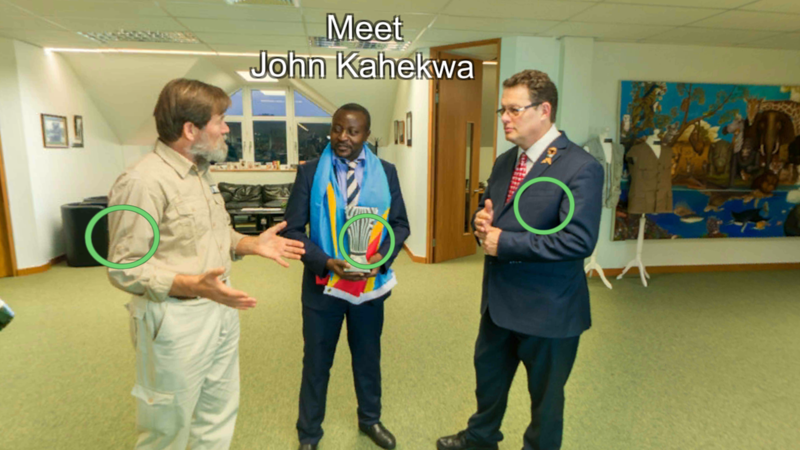 This one begins at Born Free’s headquarters in England, with Mr. Kahekwa having just received the 2016 Prince William Award for Conservation in Africa, and then we leap over 6000km to join the Easter Lowland Gorilla patriarch, Chimanuka, in his native habitat in Kahuzi-Biega National Park in the Democratic Republic of the Congo. This app works with both phones and tablets and with or without a virtual reality headset. Enjoy your Gorilla Safari! 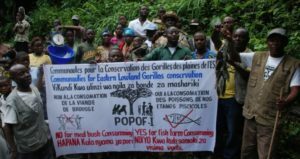 To learn more about John Kahekwa and his community-based conservation initiative, the Pole Pole Foundation, click here. To support Born Free and Pole Pole’s conservation efforts, join Born Free’s Adopt-A-Gorilla program! 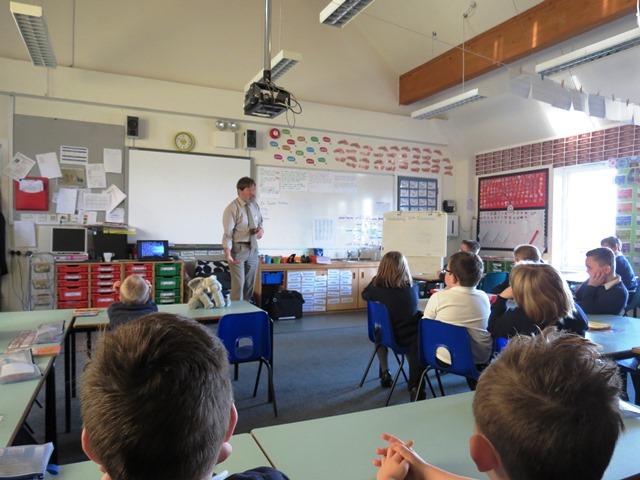 vEcotours has entered the classroom once again, this time taking children from Walmore Hill Primary School in Gloucestershire, England on a virtual safari. 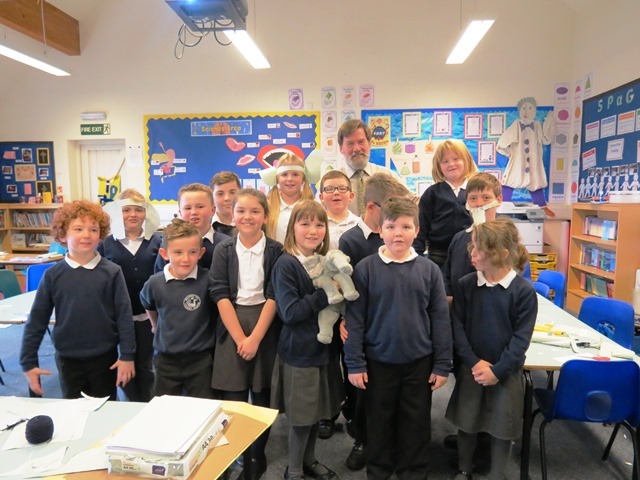 Our ambassador, naturalist Ian Redmond OBE, gave a natural history lesson to pupils, who were encouraged to think about elephants and what it may be like to be one. In a workshop titled: ‘If I’d been born an elephant…’, vEcotourism.org was used to demonstrate the diverse habitats that elephants can live in, and was used to help children see through the eyes of an elephant, in preparation for the rest of the workshop, which included making elephant costumes and role-playing being baby elephants. 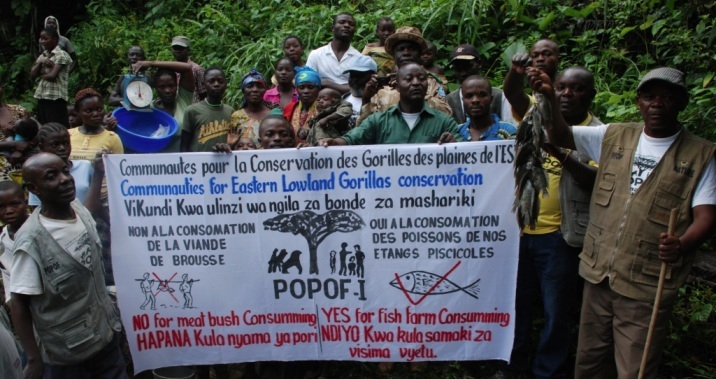 Praise for vEcotourism.org from the United Nations’ Great Apes Surival Partnership!